Event: For Valentine Subject: Spoil your Valentine! Fabulous & Creative Gifts No. of Sessions: 1 Time Schedule: 7 pm – 9 pm Date: 10 Feb | 11 Feb | 13 Feb | 14 Feb Fee: Free Audience: Adults (15+ Years) Speaker: Artists & Designers Venue: artsawa | DIFC Designers & Artists We’re in with BEADS OF JOY,ESSA,GHIDA DESIGN,LINA FARRA,MAGENTA NATION,SHAY JEWELRY,TWISTED ROOTS & More Join us for a fabulous selection for your loved ones! 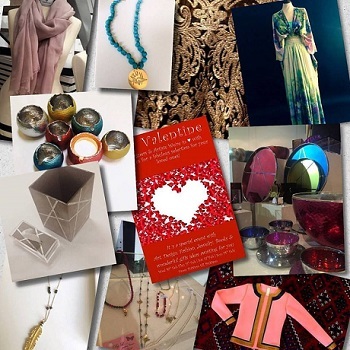 It`s a special event with Art, Design, Fashion, Jewelry, Books & wonderful gifts ideas waiting for you.